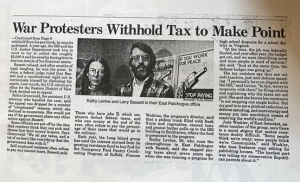 In 1985, the IRS took war tax resister and NWTRCC staff member Larry Bassett to court. Bassett had refused to pay any income taxes since 1980, and had refused the federal excise tax on telephone service since the early 1970s. The IRS wanted to compel him to give up information about his financial accounts so the agency could collect his refused income taxes. “I am not opposing taxation; I have paid the self-employment tax to support the Social Security system…. “I have not benefited financially from my war tax resistance. I have redirected all of my resisted war taxes to groups working for peace, justice and to organizations meeting basic human needs. I have shared this information with the IRS and other public officials. On June 14, Judge Weinstein dismissed the US government’s case against Larry Bassett on Fifth Amendment grounds (before the legal team was able to additionally argue the case on the basis of international law). 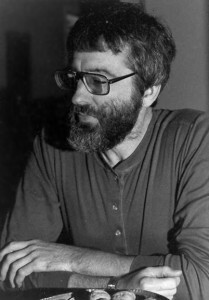 Before and since Bassett’s case, other war tax resisters have won their cases due to the Fifth Amendment, including Robin Harper, Margaret Haworth, and Ed Hedemann. In a few other cases, the IRS withdrew the Order to Show Cause once the resister cited Fifth Amendment rights. This case was an important victory for Bassett and raised the profile of war tax resistance and the National War Tax Resistance Coordinating Committee (just a couple of years after its founding in September 1982). To learn more about the progress of the case and the support and publicity Bassett received for taking a stand for peace, read these collected primary sources in two parts, with additional letters of support (courtesy of Larry Bassett). It seems clear that I was targeted by the IRS in this case because I was very visible with my resistance and a national WTR organizer. The action was taken several years after the tax filing and the amount of federal income taxes owed was $46. The government clearly wanted to send a message that would maintain its image of relentless enforcement. One of the seldom told stories of this case is this one: Kathy and I lived in the small Long Island town of Bellport. We were relatively well-known in the town banks because we had previously worked for the CMTC which had a WTR escrow account with tens of thousands of dollars. There were three banks in town. We learned that IRS agents went from bank to bank to see if I had an account they could seize. The irony or maybe I should say the officia The irony or maybe I should say the inefficiency of the IRS was on display as they went to two of the three banks, skipping the bank where I had an account. As an individual I was prepared to make my statements of conscientious resistance in court and go to jail. However the collective decision of the WTR movement was that it would not be good for an organizer to go to jail. Many thought it would have a chilling affect on other potential resisters. So with an abundance of dedicated legal support and a legal defense fund with donations from many non-resisters, legal arguments based on constitutional issues were developed. Regrettably we were unable to pursue most of the constitutional issues because Judge Weinstein fairly quickly ruled in my favor based on the Fifth Amendment. Some people in civil disobedience cases have intentionally declined to claim Fifth Amendment protections prefering to attempt to force courts into ruling on other amendments. However the Fifth has led to some success In WTR cases and the IRS has very likely declined to pursue many collection cases knowing this plea stops their cases. Great work, Larry. Thanks for your stamina in this precedent-setting case and thanks for sharing the story behind it. It is a terrific help to WTR counselors! This isn’t a comment on the current post. I’d just like to find out whether my comment that mentions Richard Wolff was published or ever will be. Thank you. Dana, I looked through our comments moderation queue, as well as spam and trash, and I don’t have anything from you. It looks like it just didn’t go through originally. Sorry! Keep in mind that this has only worked in courts. Writing “Fifth Amendment” on your 1040 form will not work and very likely get you saddled with a $5,000 “frivolous” fine from the IRS. Though it might seem to many of us that the First Amendment should also work, to my knowledge, it never has for war tax resisters in federal court. In response to your separate comment: We moderate all comments on the blog so that’s why your comment didn’t post right away! I have happily just passed the nine-month mark of my first year of massive resistance. I mark this new beginning of my life on June 11 with the death of my father and with my commitment to redirect as much of my inheritance to make a better world. Dad left me $1 million with instructions to distribute about half of it to grandchildren and great grandchildren and special others. I did that and set to work on my half. My commitment to civil disobedience in honor of my mother who became a criminal for peace in her later years is acted out in my case with war tax resistance. I will resist the $128,005 I owe in federal income tax next month. I will have donated more than that amount to meet human needs internationally and nationally and locally. To honor my father and mother I am trying to do as they did many times in their lives in trying to directly help the less fortunate. They were brave and compassionate by giving money and offering a place to stay in their home and loaning other personal goods. They found that helping others was not always free of risk. People who were ill and without resources sometimes took advantage of them. But my parents knew that they had much and others had little. Since I live in the Internet age I have had a much broader range of people in need. While I have given to many charities I have also tried in a very small way to help some individuals in Haiti and Kenya and Uganda who had little compared to me who had been left with so much by my father. My effort with individuals has taught me a lot about the desperation of poverty. I have often remembered my first job out of college working with the poor in Pontiac Michigan. Back then I came to the conclusion that what the poor need most is money. So when I found the international charity GiveDirectly that gives cash to the extremely impoverished in East Africa, I knew I had found an Organization that I wanted to support significantly. I do not know what the justice system will do when I refuse to pay my federal taxes in April. I am a little bit scared of what they might do just as I was scared in 1985 when they took me to court. But sometimes as my parents knew and as they taught me by their example you have to do what you have to do.